Kevin, who has been a friend for nearly 23 years would not find my questions nearly as problematic as his defenders and Obama’s disciples. He would and I am sure does understand both me and my bewilderments at his positions. More than once we have laughed at each other and chided each other just for fun. For I also remember his giddiness about Clinton and Al Gore. Every four years a new prophet has entered and Kevin’s a political monster. Kevin is a democrat and I am a socialist with little or no respect for anyone who would want to be president. “Giddiness about Clinton and Al Gore (the bore)?” A new prophet every four years? Kevin is a democrat? Mike is a preacher, so I will chalk up all of this to “preacha’s license” – overstating things in order to make a point. But I guess I am still baffled by so much talk from anti and semi-anti Obama folk accusing everyone who might like to see different leadership as “starry-eyed disciples” swayed by a “silver-tongued devil” that can’t wait for our anointed messiah to rise from Bethlehem’s stable and take his proper seat in the oval office at the right hand of truth, justice, and the pursuit of the American dream. 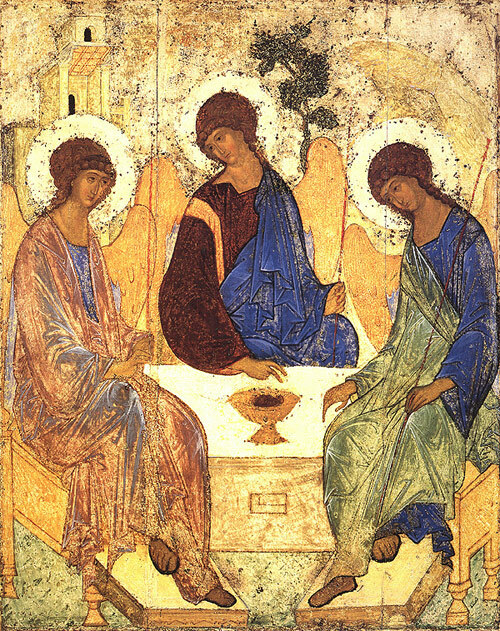 Now … if someone could just help me photoshop that picture above so that it says the “New Yorker” above it … or maybe I could tinker with Rublev’s icon of the Trinity and superimpose Obama in the middle? 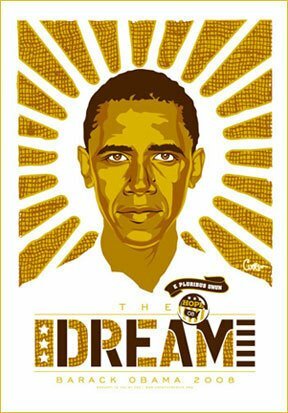 >Bless be the ties that bindour hearts in Obama’s tribethe fellowship of brainwashed mindsis liked to that above! >Oh from a splintered tongue to singour great Obama KingHe is the one who brings the dayand brightens all our sin. >Onward Obama followersmarching out of Iraqheading to Afgha-ni-stanto settle the real fight.Obama is our saviorJesus is past thoughtunborn children dyingin this savior causeOnward Obama followersMichael’s is headed to hellfor he is a false prophetwho missed the savior’s return.